Several years after becoming a co-op member, my husband and I found our dream farm. It’s a hilly Iowa farm with a beautiful, private view overlooking a valley and tree-covered bluff. Our lives on the farm gave us new opportunities to explore the value of organic growing. As vegetarians, we were excited to get our first garden of organic heirloom vegetables started at the farm. Sadly, the first year in the garden produced some sorry plants and hardly any harvest. We’d been accustomed to a bountiful heirloom vegetable crop from our garden in our prior tree-lined neighborhood in town. We had high hopes for our garden at the farm. Our disappointment led to research on organic gardening. We were attracted to the organic gardening books of Eliot Coleman, an organic CSA farmer in the upper Northeast, and we also consulted with neighbors who were farming produce organically. We learned our main efforts in the garden require “gardening” the soil itself. 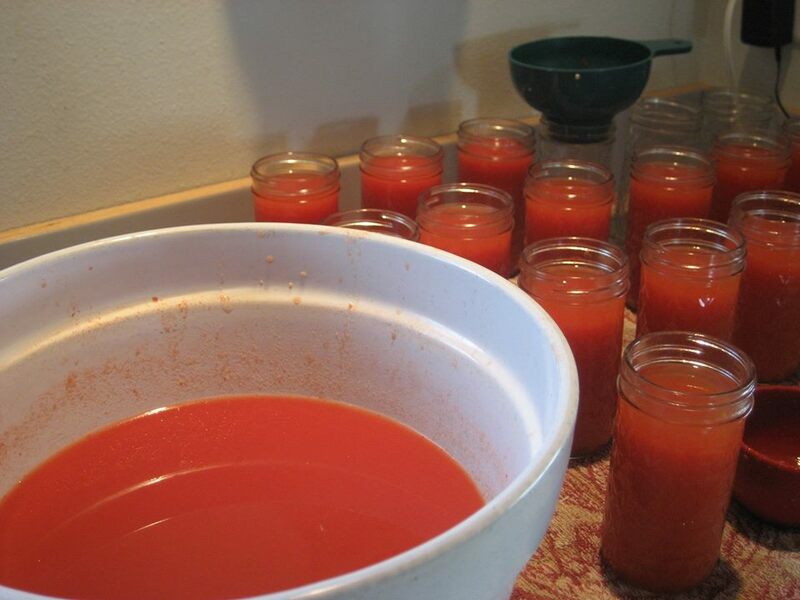 The first batch of juice from our canning of 85 pounds of tomatoes. We now employ the organic techniques of planting cover crops of winter peas, buckwheat, clover, etc. We add many truckloads of organic compost each year. Companion planting is our approach to planting in our gardens — planting vegetables and flowers which mutually benefit each other side by side. We also rotate the vegetables in the garden so that no vegetable is planted in the same location from one season to the next. This helps diminish the potential for pests and avoids overuse of a garden area. Tomatoes, for example, are heavy feeders — meaning you will do well to move them to another garden spot each year. Alliums (garlic and onions) are beneficial crops. We typically plant our tomatoes where we last grew our 300 heads of garlic the previous year. Some spots in the garden are left fallow each season to restore their fertility. We also replenish the soil nutrients with intensive cover crop rotations. Each year our soil and harvest have continued to improve since we began these efforts in 2005 — with last year being our best year to date. Last year, I canned 85 pounds of organically grown heirloom tomatoes for use through the year. I also canned other produce, such as sweet and chili peppers, green beans, carrots and salsa. We’re converting forty-plus acres of the farm that previous produced conventional corn and soybeans to a restored tallgrass prairie. Avoiding conventional farming methods on our hilly farmland has already greatly slowed erosion. (Years of erosion depleted the land of nutrients before we moved to the farm.) 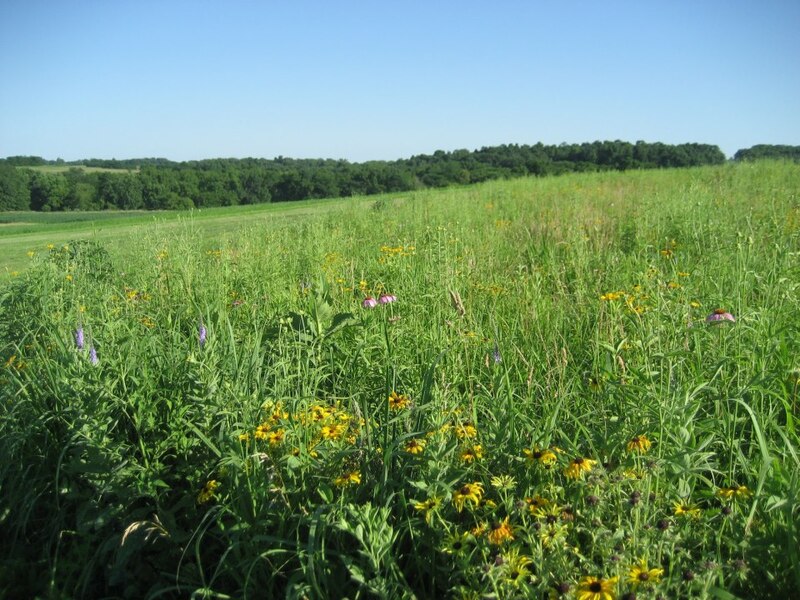 Native prairie grasses and forbs now cover our farm, providing much needed habitat for pheasants, wild turkeys, doves, hawks, eagles, herons, harriers, woodpeckers, deer and other wildlife. Our years at the farm have given us affirmation of our efforts to enhance the land and create an organic haven for all who inhabit this little piece of earth. 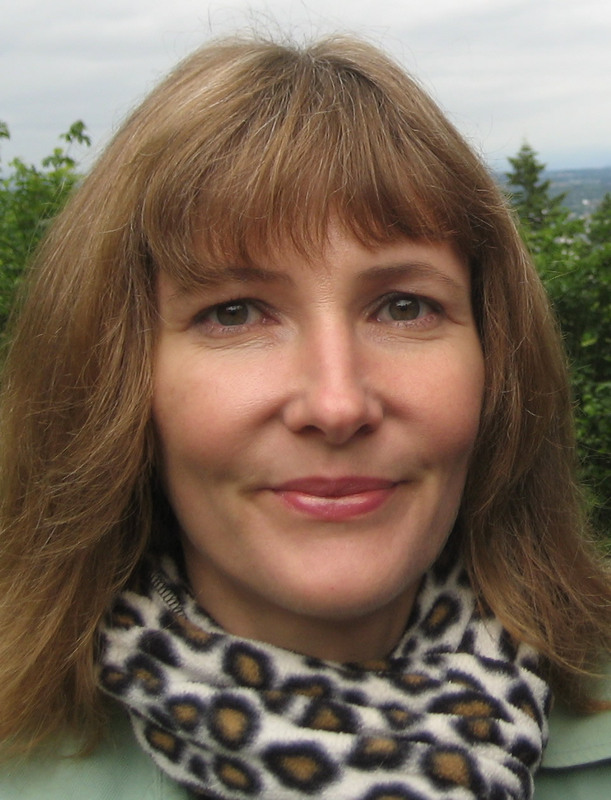 About the Author: Joanna Mouming has worked in the organic food industry for the last decade and is currently a Quality Analyst at Frontier Co-op. She is a yogi and a longtime user of holistic body work therapies. Joanna loves to cook from scratch and entertain. The home she and her husband built on their farm was recognized in 2009 as one of the Best Homes in America by Dwell magazine.